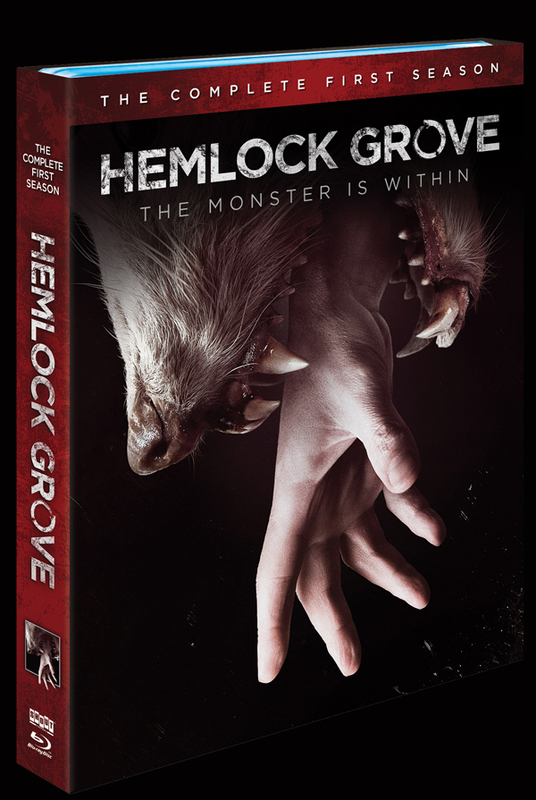 Schlock-Wire: Visit HEMLOCK GROVE On A New Scream Factory Blu-Ray Set – Schlockmania! Pack your bags and say your prayers — you’re on your way to Hemlock Grove. From executive producer Eli Roth, the Primetime-Emmy© nominated Netflix Original Series Hemlock Grove: The Complete First Season arrives on Blu-ray and DVD October 7th, 2014 from Scream Factory. Featuring all 13 exhilarating episodes from the shocking first season, the three disc set also includes all-new bonus features not available on Netflix including six all new vignettes. Horror aficionados should note that additional bonus features will be announced as excitement builds for this release, and fans can pre-order their copy now at ShoutFactory.com. Executive produced by Eli Roth (Cabin Fever), based on the novel of the same name by Brian McGreevy, created by McGreevy along with Lee Shipman and starring Famke Janssen (X-Men) Bill Skarsgård (Anna Karenina), Landon Liboiron (Altitude), Penelope Mitchell (The Vampire Diaries), and Dougray Scott (Mission: Impossible II), Hemlock Grove: The Complete First Season, produced by Gaumont International Television for Netflix, is an atmospheric and gripping horror thriller series unlike anything you’ve ever seen.